Casa Desiderata...definitely worthy of desire! This gorgeous casita is within walking distance to the plaza, historic sightseeing, authentic New Mexican restaurants, art galleries, and more! 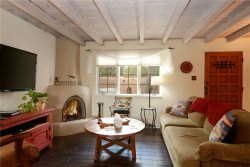 The absolute ideal Santa Fe vacation stay! Tucked away in a small compound it offers peace and quiet, yet is just steps away from everything! This casita is sure to please! Total comfort and tranquility await your arrival! Book today! This authentic style casita has been updated with the comfort items of today, but still maintain its authenticity. Mini-split heat/ac units have been added to each room for total comfort! We also usual luxury quality linens on all our beds! You will have access to the entire casita and full use of its kitchen, fireplace, and outside grill! I manage several properties throughout town. I offer my guest self-check-in, but I can make myself available if needed. I'm always just a phone call away!